GPS will not work for our address! Take until road T’s.At stop sign take a Left onto TOWN CREEK ROAD. 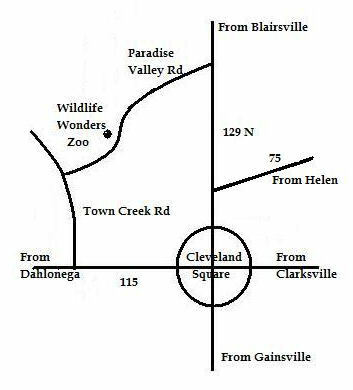 Turn L onto Paradise Valley road.Go approx: 3 miles.The Zoo is on the right. Turn R onto Paradise Valley road and follow the above directions. Cavender Creek Road,turn L onto Town Creek Church Road- then follow the directions from 400.